Are you looking for Mother’s Day Gift ideas? Do you have a Mum who enjoys being active, loves the outdoors or is on the sporty or adventurous side? Then OneLife iD sports, emergency and medical bracelets and necklaces can make a great Mothers Day Gift. They provide Peace of Mind for friends and family with the reassurance that Mum is carrying personal identification with useful emergency contacts or details of any medical conditions. For the month of March, leading up to Mothers Day on Sunday 31st March 2019 use discount code LOVEMYMUM to receive 10% off any OneLife iD products. 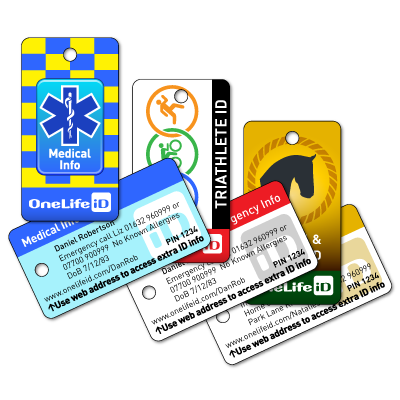 Whether Mother is a keen runner, cyclist, keep fit fan or horse rider or just loves being outdoors or walking the dog then OneLife's range of personal ID necklaces or wristbands can provide Peace of Mind for friends and family and critical emergency or medical information for first responders in the event of an emergency. They are also great for those who are prone to wander or forgetful. 1- Medical ID necklace with stylish, slimline stainless steel pendant. Custom engraved with up to 4 lines of medical information and emergency contacts. The slimline ID necklace is new to our range in 2018. 2 - Freestyle ID wristband with Stainless Steel Tag which is available in 3 sizes and has a choice of Black or Stainless Steel ID tag. Lightweight and slim line, this sports ID wristband is ideal for active Mums. Waterproof and durable they are ideal for sports and activities both outdoors or in the gym. An alternative is our woven, nylon strap ID bracelet with watch style clasp. The Emergency ID wrist strap with NATO nylon strap and stainless steel ID tag is available in a range of colours and patterns. 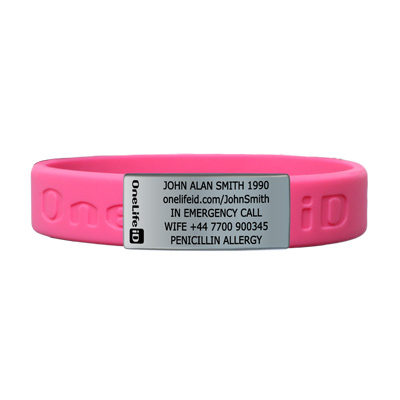 All our ID bracelets are personalised with your choice of emergency information engraving. 4 - Emergency ID wristband with bright Lumo coloured silicon strap and black tag. Choice of 8 bright coloured silicon straps, this emergency ID wristband really stands out and the strap and fold over clasp means it fits any adult wrist size. 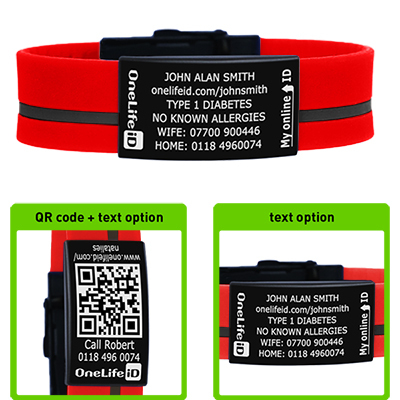 The smart anodised black steel tag is engraved with your choice of emergency instructions, contacts, medical conditions or allergies. Our child Emergency ID with slimline 12mm wide woven nylon wristband and stainless steel ID tag is suitable for those with slimmer wrists and the woven nylon strap is available in a choice of colours and styles. For busy Mums we have our Key ID Tag – at £7.49 for 3 tags these are a great way to conveniently carry emergency contact information or medical details. Just attach to key ring, bags and belongings or tuck into your phone case. These durable PVC tags are available in a wide range of colours and printed with personalised contact, emergency or contact information. For those that prefer a more traditional emergency ID the Medical ID card is also available. The ID Card can be kept in purse or wallet and has the benefit of being able to include up to 20 lines of detailed medical information and emergency contacts. OneLife iD Medical Alert and Emergency ID Card is a convenient way to carry emergency contacts and instructions for medical conditions, allergies or for everyday peace of mind. Fits into purse or wallet. Personalised with details of your allergy and instructions on what to do next. If you want to know what to put on your ID tag or ID wristband then Click here to find out more. ID themselves - our emergency ID bracelets and tags make it easy to carry emergency contacts or medical information. Our handy MiniTag key ID is also a great way of carrying contact information or medical details whenever you are out.